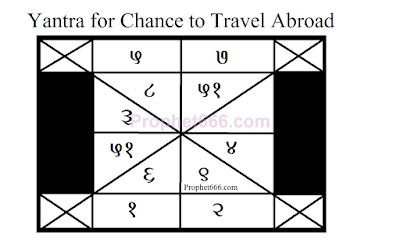 This Yantra is believed to enhance the chance of a person who wishes to travel to or settle down in a foreign country. 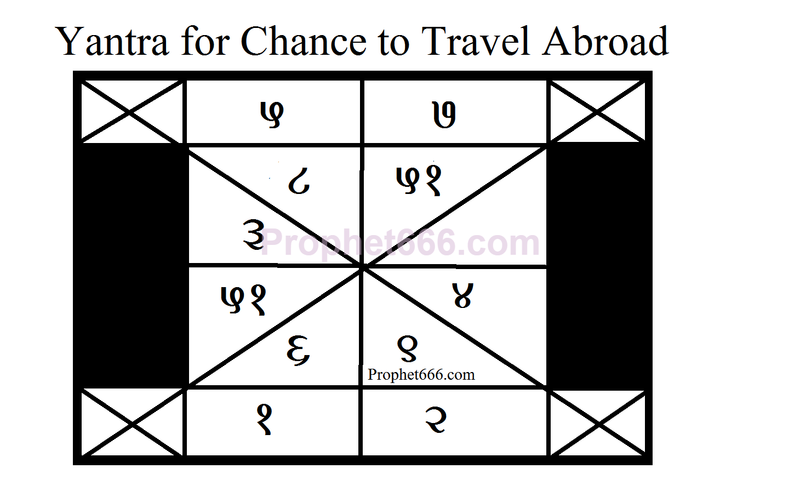 Those persons who are trying to travel or settle abroad can try this special Yantra. There are some rules prescribed in the Tantra for performing this Yantra Prayoga, which, I have described below in this post. The Yantra can be prepared on any day as shown in the diagram. It can be prepared on a Blank White piece of paper using Black Colored ink or on a Bhojpatra using Ashtagandha paste as the ink, using a pointed wooden stick as the writing instrument. As usual, the Yantra should be worshipped by offering it Agarbatti/Dhoop/Deep and Scented Flowers. Then it has to be folded and put inside an Ashtadhatu Metal Locket and tied on the Right Upper Arm as a good luck Charm. The Ashtadhatu Locket is a Locket, which is an amalgamation of eight different metals and is easily available in any jeweler shop in India. The practitioner can perform Ganesh Upasana and donate food to the poor and hungry. This part even though not mandatory as per the Tantra, it increases the chances of success in this Yantra Sadhana. I,ve noticed in lots of yantras where you mentioned to use a pointed wooden stick for yantra writing,but which 'specific stick' is not mentioned ie; (guava/pomegranate etc) in that case shell we assume any wooden stick or which one is commonly use for writing as per your valuable suggestion, while particular stick is not mentioned, so we use it commonly for writing for any yantra. plz Sir kindly guide me.. When a specific stick is not mentioned, you can use any small pointed stick to draw the Yantra. As I don't know how to speak nor write in Hindi/Sanskrit, can you please show an example of this yantra in English. The Tantra specially mentions Ashtadhatu as the Metal of the Locket, you can try using Panchadhatu if you have no option. You can keep the Yantra in your pocket or use it like a charm around your neck. Sir, i'' trying to ho abroad for studies, but my visa got denied. The Yantra should be prepared as described in the post, if you have made an error, then, you can make another Yantra by following the same procedure.